Short walk to beach or golf, wi-fi, games area, family friendly! Other awards include "Best self-contained Accommodation in Australia", "Best Beach Accommodation in Victoria", and state finalist for "Best Pet Friendly Accommodation" and "Best Family Friendly Accommodation". Enjoy comfortable beach accommodation at Sea Eagle Beach House superbly located just 400m to the beach and playground at Safety Beach foreshore! *2 bathrooms, 2 toilets, full bath and 2 showers PLUS outdoor shower, ideal for after the beach! *Portacots (2), change table and high chairs (2) are available. Bedroom 2: Triple bunk room, sleeping 3 plus TV & DVD player. Bedroom 3: Triple bunk plus single bunks, sleeping 5 plus LCD TV + DVD player. Walk to the cleanest, clearest Mornington Peninsula beach in 3 minutes, or to the neighbouring Safety Beach Country Club, only 250m away. The 18 hole challenging golf course is the best value on the Peninsula and there are 5 tennis courts available for just $12 an hour. The Club has licensed bar, clubrooms, cafe and you can dine at the Atrium restaurant - just 5 minutes from home! Safety Beach sailing club, boat ramp and Martha Cove Marina are minutes away. Dromana Village Shops are a 15 minute walk along the beach. Wineries, art and craft markets, mazes, Peninsula Hot Springs and antique centres are a short drive away. Sea Eagle Beach House is ideal for families, friends or groups. Special rates apply for couples or a single guest in off-peak periods - please enquire and we will be happy to quote for you. Sea Eagle is a popular destination for golf, boating, fishing, wine touring, family holidays and just relaxing on the beach. Tariff includes doonas, doona covers, pillows, pillowcases, teatowels. Just BYO top and bottom sheets and towels, or full linen and towels can be hired for $44 per bed. Single night stays may be available during off-peak times - an additional surcharge applies. Please enquire for a confirmed quote. 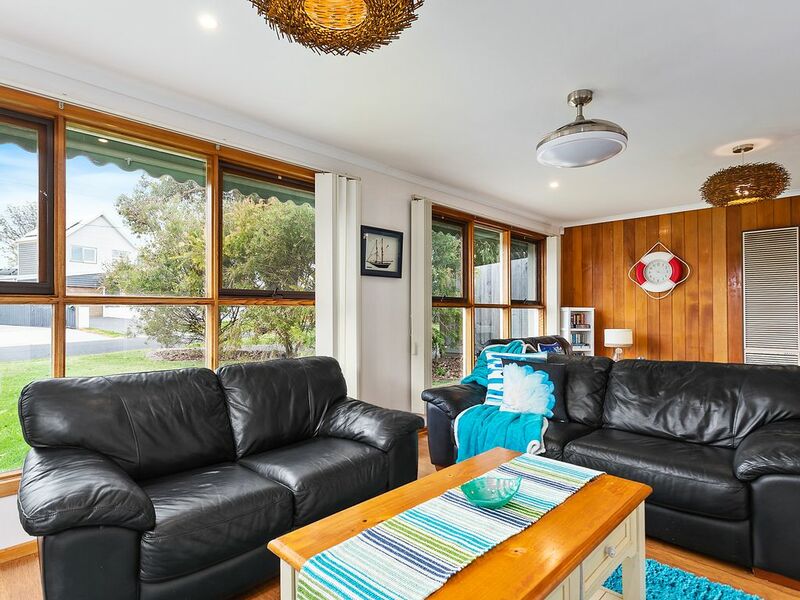 The property welcomes well behaved OUTSIDE pets and is located close to a leash free beach - one of the only leash free beaches on the Mornington Peninsula. SORRY - not available for schoolies, groups of under 30s, parties or functions. Sea Eagle has been described by one of our guests as an "Entertainment Powerhouse". If you can tear yourself away from the stunning beach, just around the corner, you can enjoy the entertainment facilities at the house. Games room and climbing gym, games, dvds, pool table, table tennis, books to read, 4 TV's, WiFi and Wii console... you will not be bored at Sea Eagle! Super location and great entertainment facilities are on offer at Sea Eagle making it our most popular alternative for families. Split system, gas heating and panel heaters. Doonas, doona covers, pillows, pillow cases, bath mats and hand towels, tea towels are provided for you. BYO top and bottom sheets and towels OR linen hire can be arranged for $44 per bed. Garage is set up as games room. Long drive way allows for off street parking. Huge DVD library to choose from. Nice home! Would recommend for all ages. Nice house! Has everything you need. We were in the area for the weekend, so x10 30 year olds stayed here and we had such a fun weekend. The only downfall is we were a little stressed regarding noice/music after 11pm as the neighbours are close by but we luckily we had no issues. Thanks, Brooke. It's great to hear you had a great time. The "no excessive noise after 11pm" is a directive from council which applies to every holiday house on the Mornington Peninsula. We are glad, however, that you were mindful to be respectful to the neighbours, as the best guests always are! Really enjoyed our stay. House was very clean and well set up. Great outdoor dining area and kitchen had everything we required. Highly recommend to others. Thanks, Megan, for your wonderful recommendation! I am so happy you enjoyed the set up at Sea Eagle Beach House as guest happiness is so important to us! the street is quiet, and the access to beach is good. The house is old and the doors a little difficult to close. the ease of stay unfortunately was a little tainted by an overload of rules and regulations posted, emailed and texted which took the 'relax' out of the holiday especially considering we had sand all over the one bedroom we had access to, (including in the bed) and quite a few coachroaches in the kitchen - we had to do a big vaccuum on the first day. we did make the most of our holiday regardless but would not rush back to this house or use this property broker again. Sea Eagle is located in a quiet street with easy access to the beach, but sadly, Debbie's review is very disappointing from that point on. Debbie booked and paid for a room for one couple and said that there would only be 2 people staying. However, she had planned to fill the house with guests without paying for them, which is against the rules, so I don't make any apologies for the fact that we did not allow her to have a house full of people for the low couple's price. This made Debbie upset and she has clearly lashed out with a false review. There are no cockroaches in the kitchen. The property is professionally cleaned between each guests and checked by the owner before each new group check in. When I contacted Debbie during her stay to make sure everything was fine for her, she did not raise any concerns. Our reviews speak for themselves, as we have an abundance of very happy guests who return time and time again. Cleanliness has always been a feature of this property and our high standards will continue to be maintained. Roomy and house provided most necessities. Enjoyed safe walks and proximity to golf club. Thanks for your review, Robyn. I'm glad you appreciated the extra facilities provided for children and the easy walks around Safety Beach. We thoroughly enjoyed our stay at Sea Eagle! Thank you for having us, we will definitely be back!! Thanks for your lovely review, Marisa, and for being such a wonderful guest! We look forward to having you back to stay soon! Recommended Beach House, great location! This was our second visit to Sea Eagle and it was even better than last time! The bathroom has been renovated since our last stay. There are lots of little extras that we would not expect for a holiday house. Although it was rainy, we had plenty to keep us entertained at the house. Beds were comfy and with 2 families staying we felt it was just the right size for us. We will definitely be back! Thanks for your kind review, Bella. We love hosting return visitors! Glad you liked the new bathroom and we look forward to your next visit. Thank you for being wonderful guests. Less than a 5 minute walk will take you to the stunning beach, with beautiful views of the Mt Martha clip tops on one side and the gently curving peninsula on the other side. Or you can take a 5 minute walk to the Safety Beach Country Club to enjoy golf, mini-golf, tennis or dining at the Atrium restaurant or bar. Sea Eagle is close to boutique cafes and the quaint shopping strip of Dromana. It is a beautiful area for wine touring or a 15 minute drive and you can relax at Peninsula Hot Springs. Sea Eagle is close to Stillwater at Crittendon Estate, the Pavilion at McCrae and other local wedding venues. There is a traditional drive-in just a 5 minute drive away, or the National Park, Arthurs Seat Eagle skylift with amazing views and Seawinds gardens at Arthur's Seat. A 10 minute drive and you can explore the Enchanted Maze or Ashcombe Maze. Cinemas at Rosebud are 10 minutes away, plus an indoor swim pool and larger shopping centre. There is so much to do in our local area, one visit won't be enough!